One of the best kept riding secrets in Texas! Most of the approx 40 miles of trails on Zars are unmarked (no ribbon) two way trails. There are approx 10 miles of marked (colored ribbon) one way trails on the property. Always keep the colored ribbon on your right when riding a marked trail. 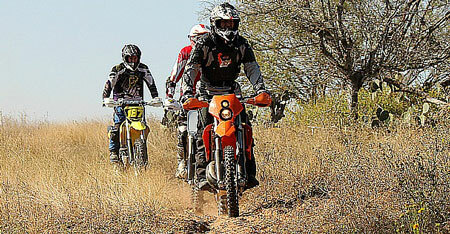 We currently have a 3.5 mile Pink ribboned motorcycle/ATV trail that is beginner friendly. 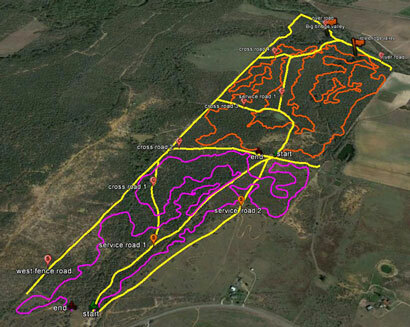 We also have an 5.5 mile Orange ribboned trail that is motorcycle only and a bit more challenging. There is a 2 acre area set aside near the parking area for the little guys and gals to ride. Mostly flat and hard parked terrain and larger bikes (except for mamas and papas keeping an eye on the younguns) are prohibited. Member access for open riding is 24/7 with the exception of work hours during work days, all day on race days, and the morning of Family Fun Days. Zars has ample parking area, picnic tables, lots of shaded pit area, and porta potties (which are normally serviced weekly). Bring your own food and water. Zars is approx 1/2 mile wide by 1 1/2 miles long (324 acres) and has approx 45 miles of trails including single track, 2-track, sandy field tracks, and hill climbs. The property has some fun elevation changes as you approach and explore the San Antonio river area. The terrain is diverse, ranging from loose and sandy to clay and hard pack. We also have a 3 acre area (trails are wide, clay hard pack, flat, and ribboned for direction) set aside for the "little ones" to ride that is within walking distance of the parking area. Note that cars/trucks are not permitted beyond the parking area with the exception of work days. Guest riding is allowed and the fees are $20 for adults and $10 for youth age 15 and under. The maximum fee for a family is $40. All fees are for a per rider (family), per day basis. The guest(s) must be sponsored by a current club member, and that member must be present at any time the guest is on	the property. To request a Guest Rider Sponsorship, go to the Forums and post in the guest rider request thread and give the date/day that you wish to guest ride. The guest rider form can be found here although copies are also available at Zars. The parking area doubles as a campsite area and members are welcome to camp. We try to keep a good stock of firewood available for members to use on site. Please don't take (steal) firewood from the property. There are cattle on the property and they are so used to motorcycles that you have to give them time (and sometimes just a bit of encouragement) to move out of the way. Also, it's not unusual to see wildlife (deer, cototes, armadillos, snakes of all sorts, javalina, feral hogs, owls, hawks, turkeys, chupacabras, etc) on Zars. We keep Zars clean!!!! DBSA has been leasing Zars for some 30+ years. The landowner appreciates the way we've taken care of the place. Please be sure to pick up after yourselves so we can continue to enjoy this property. This riding lease is located southeast of San Antonio and a few miles south of Floresville. From North East area (Live Oak, Universal City, Schertz): Loop 1604 West, Hwy 181 South (towards Floresville), FM775 West, FM1303 South (Proceed 2.5 miles towards Floresville). Look for the gate on the left side of the road with the yellow 'DBSA Members Only' sign just inside it. From the airport: 281 South, IH37 South, Loop 1604 East, FM1303 South (Proceed 8.5 miles towards Floresville). Look for the gate on the left side of the road with the yellow 'DBSA Members Only' sign just inside it. 20. NO FREE GUEST RIDERS! Guest riding is only permitted when the proper guest riding forms have been completed, the day riding fee has been paid, and the sponsoring member is present. Guest rider fees are $20 for adults and $10 for youth age 15 and under. The maximum fee for a family is $40. All fees are for a per rider (family), per day basis.